Are you a chef, restaurateur, foodie or gourmet who is ready to find the love of his life? 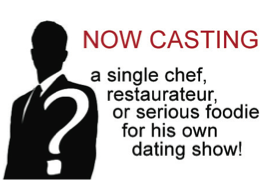 Pilgrim Studios (www.pilgrimstudios.com) is looking for a single, attractive and charming culinary enthusiast to be our featured bachelor on a new, unscripted show for a major cable network. If chosen, you will be featured on your own series and have the opportunity to date a select group of amazing women who share your love for great food and the culinary arts. You MUST have a strong background in cuisine (food writers and connoisseurs welcome as well! ), and be the kind of man who thinks that there’s nothing sexier than a woman who can cook her way into your heart. If this sounds like you, and you’re ready to make spectacular meals with the perfect woman, then contact producers TODAY! Email CulinaryBachelor@gmail.com with your name, age, location, a recent photo and a brief description of why you’d be perfect for this show. Deadline to submit is November 9, 2011! Producers are waiting to hear from you NOW!